By winning their last five games and returning sixteen starters, the Hilltoppers are gaining plenty of momentum heading into the season, especially considering that they scored 116 points in their last two games of the season. Anytime you score 116 points in a two game stretch it’s impressive. It’s even more impressive when that’s not a fluke. The Hilltoppers finished last season averaging 44.4 points per game, good for 6th in the FBS, and the biggest pieces of that offense return. 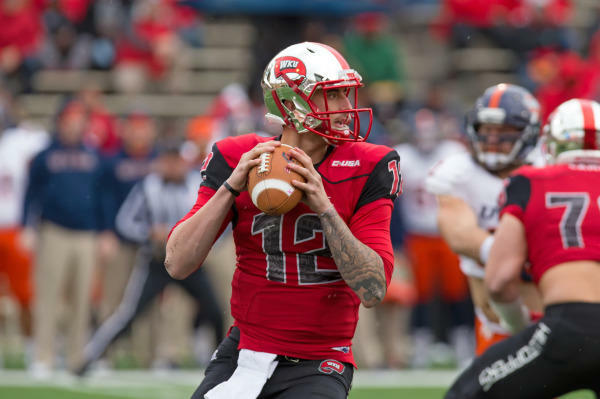 Brandon Doughty is unanimously considered the preseason 1st team All-CUSA quarterback, and it is well deserved. He was beat out for the same spot in last year’s postseason only by departed Marshall passer Rakeem Cato. Doughty put up a gaudy 4,830 passing yards and 49 touchdowns last season, which was good enough to make Western Kentucky the number two passing team in the FBS. Now, Doughty looks to replicate that this year, and he has the pieces around him to do it. With the eye-popping passing numbers, it’s easy to overlook the running game, but don’t give way to temptation. Leon Allen and Anthony Wales return to form a two-headed monster that rushed for over 2,000 yards, 18 touchdowns and lost only two fumbles. They were also pretty explosive too, averaging nearly six yards per carry. Allen is also a danger in the passing game as he caught 51 passes for 476 yards a season ago. Considering that the Hilltoppers have the top quarterback in the conference, it’s almost unfair that he gets to throw the ball to arguably its top receiving corps too. Jared Dangerfield and Taywan Taylor are both dangerous receivers, as evidenced by the almost 1,600 receiving yards between the two. Those guys open up space for guys like Allen, TE Tyler Higbee, and possession receiver Antwane Grant who caught nearly 70% of his targets last season. Losing a four year starter and second-team all-conference pick at right tackle will hurt, but returning three starters and a fourth with ten career starts should make that replacement process smoother. Left tackle Forrest Lamp is the most experience remaining starter with 25 career starts, and the man tabbed to step up at right tackle Joe Manley (fitting name) certainly has the size you want in a right tackle at 6’6” and 320 pounds. I’ve mentioned two times now that Western Kentucky scored 116 points in its final two games, but what I conveniently left out was that they gave up 114 points in those same two games. You wanna know how a team averages almost 45 points per game and goes 8-5? That’s how. 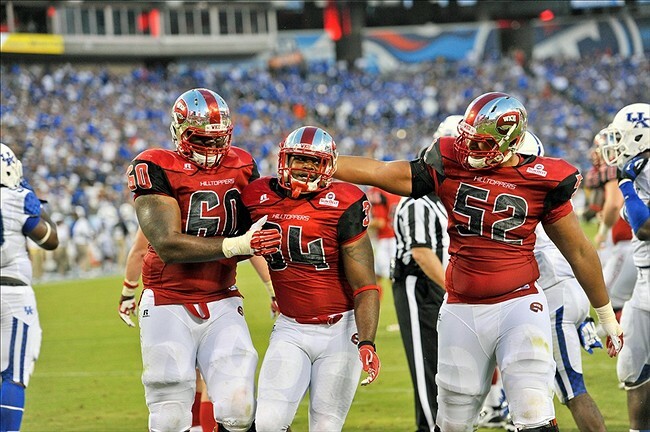 All in all, the Hilltopper defense gave up more than 40 points eight times, and 48 or more points five times. They’ve got to do better than that if they want to fulfill their preseason aspirations of a conference title. One positive is that every defensive lineman of note returns this year, and UAB transfer Jontavious Morris should add some size and depth up front and help improve the run defense. Gavin Rocker and Brian Shorter are also solid pieces as they managed 7.5 tackles for loss and 5.5 sacks apiece last season. The linebackers are looking at a similar scenario. Terran Williams is a more noteworthy departure than anyone from the line, but the key linebackers from 2014, Nick Holt and Dejon Brown, are back. Holt and Brown had over 150 combined tackles and 15 tackles for loss in 2014. Safeties Branden Leston and Marcus Ward return after both registering over 50 tackles last year, and Leston hauled in four interceptions to go with that. 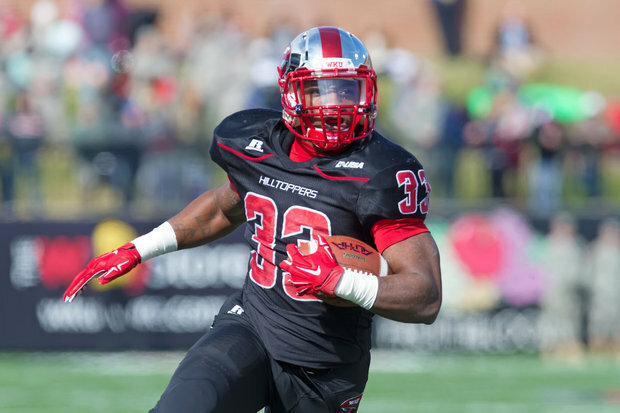 WKU also gets back the winner of the “Most Optimistic Name” Award in cornerback Wonderful Terry. Seriously, that’s an awesome name, but his counterpart across the field might have him beat. Prince Charles Iworah was only sixth among defensive backs in tackles, but he did play in every game and intercepted a pass and broke up five more. This team could very easily win the conference in 2015, especially when you consider that they get both of the other most serious contenders for the C-USA crown at home. However, I think the defense might still keep them a step behind Louisiana Tech and Marshall in the conference hierarchy. Plus, Marshall will be revenge-minded when they travel to Western Kentucky this year after the Hilltoppers ruined their perfect season and New Year’s Six hopes in the last game of the 2014 regular season.